The Prairie Pod communicates the science surrounding prairie conservation, restoration/reconstruction, and management. Each episode covers a prairie-focused topic, and offers insights on related literature and places to explore Minnesota's beautiful prairies and other amazing natural areas. You'll hear discussions from a variety of experts, tackling the complexity, challenges and beauty of Minnesota's prairie landscape. This work is part of the Minnesota Prairie Conservation Partnership, which works underneath the Minnesota Prairie Conservation Plan to protect, restore and enhance prairie and wetland habitats. New episodes are available weekly. Episodes are available to download or listen to in iTunes. Today's podcast is about our favorite subject - prairies and how to grow them from scratch. Sluis et al. 2017 Multiscale metrics differentiate among tallgrass prairie restorations and remnant ecosystems along a restorative continuum. Restoration Ecology. On today's podcast, we'll chat with Scott Roemhildt, from the Minnesota Department of Natural Resources, and Megan Howell, with Pheasants Forever. We'll cover the Walk-in Access Program - what it is, how it works, and how to hunt on these awesome private lands. Drum, R. G., C. A. Ribic, K. Koch, E. Lonsdorf, E. Grant, M. Ahlering, L. Barnhill, T. Dailey, S. Lor, C. Mueller, D. C. Pavlacky, C. Rideout, and D. Sample. 2015. Strategic grassland bird conservation throughout the annual cycle: Linking policy alternatives, landowner decisions, and biological population outcomes. PLOS ONE 10:1-16. We'll discuss sourcing seed for prairie restorations. Should you mix or match seed? How far is too far? And general guidelines for safe seed sourcing. Espeland, E. K., N. C. Emery, K. L. Mercer, S. A. Woolbright, K. M. Kettenring, P. Gepts, and J. R. Etterson. 2017. Evolution of plant materials for ecological restoration: insights from the applied and basic literature. Journal of Applied Ecology 54: 102-115. Meissen, J. C., S. M. Galatowitsch, and M. W. Cornett. 2015. Risks of overharvesting seed from native tallgrass prairies. Restoration Ecology 23: 882-891. Native plant suppliers in Minnesota. Today's podcast features a special conservationist, Dave Trauba. Dave worked as the Lac qui Parle Wildlife Management Area manager for 24 years. Augustine, J. K., & Trauba, D. R. 2015. Potential for behavioral reproductive isolation between greater prairie-chickens and sharp-tailed grouse in west-central Minnesota. Journal of Ethology 33: 15-24. Johnson, R. G., and S. A. Temple. 1990. Nest Predation and Brood Parasitism of Tallgrass Prairie Birds. Journal of Wildlife Management 54:106-111. Schlicht, D. A., Swengel, and S. Swengel. 2009. Meta-analysis of survey data to assess trends of prairie butterflies in Minnesota, USA during 1979-2005. Journal of Insect Conservation 13:429-447. Today we'll talk about one of our favorite subjects - building seed mixes. We'll explore how to evaluate your site, why diversity matters, seeds per square feet, and general guidelines for success. Today's podcast features a prairie in Nobles County and the challenges of restoring an entire section of land to prairie and wetland habitat. We're joined by Bill Schuna and Kent Schaap with the Minnesota Department of Natural Resources. Larson, D. L., M. Ahlering, P. Drobney, R. Esser, J. L. Larson, and K. Viste-sparkman. 2018. Developing a framework for evaluating tallgrass prairie reconstruction methods and management. Ecological Restoration 36:6-18. Prairie Reconstruction Guidebook for North Dakota. Today, we'll talk about the establishment phase of restoration, with Area Wildlife Manager, Jeff Zajac. The Prairie Ecologist: Exotic Beauty. The Ecology and Management of Prairies in the Central United States, by Chris Helzer. Williams, D. W., L. L. Jackson, and D. D. Smith. 2007. Effects of frequent mowing on survival and persistence of forbs seeded into a species-poor grassland. Restoration Ecology 15:24-33. Almquist, T. L., and R. G. Lym. 2010. Effect of Aminopyralid on Canada Thistle (Cirsium aryense) and the Native Plant Community in a Restored Tallgrass Prairie. Invasive Plant Science and Management 3:155-168. This week, we'll talk pheasants, grassland birds and the fall hunting season. Benson, T.J., Chiavacci, S.J., and M.P. Ward. 2013. Patch size and edge proximity are useful predictors of brood parasitism but not nest survival of grassland birds. Ecological Applications 23:879-887. Leonard A. Brennan and William P. Kuvlesky, Jr. 2005. North American Grassland Birds: An Unfolding Conservation Crisis? The Journal of Wildlife Management, 69(1): 1-13. 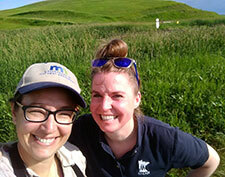 Jessica and Megan met on the prairie in 2016 at a Native Plant Community Identification Training. They share a passion for prairie and natural lands. Jessica is a research scientist with a passion for communicating science to land managers and prairie practitioners. Megan is a regional ecologist who is fascinated by the science of restoration and the challenge of building better, more resilient prairies with diversity always as the backbone.